Our C2C journey has finally begun! There have been times over the last 2 years when I thought this day would never arrive. At 66 years of age, health issues are never far from your mind …. my father sadly died at this age from a ‘heart attack’. But my cardiologist says I’m good to go! Listen to your body, he says. 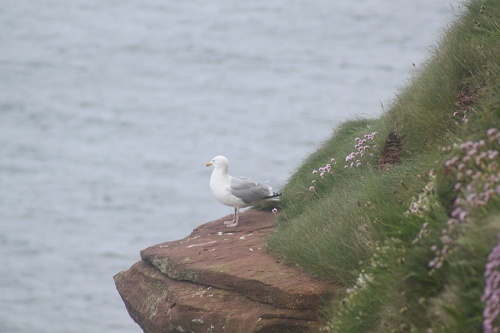 ‘If you feel like you need a rest, then have one’ …. these were his parting words. Sounds like good advice for everyone to me, no matter what their age! 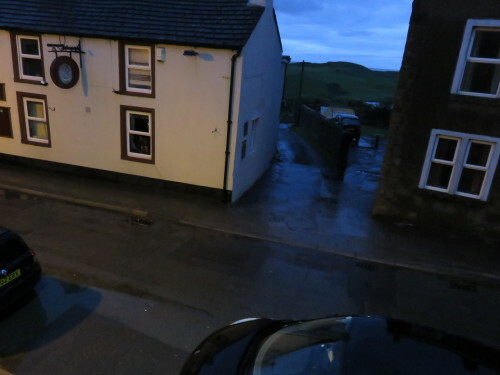 When I awoke at 4.00 am (all the excitement), it was raining! But the rain eased and we enjoyed a cloudy, but mainly fine day. So we departed our St Bees B&B, fortified with a full English breakfast and made our way down to the beach where the C2C starts. 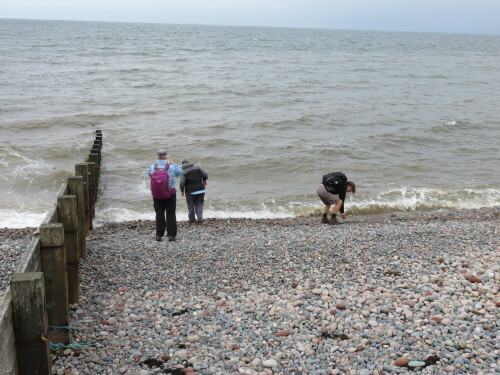 Tradition has it that, before you start, you should dip your toes (boots) in the Irish sea and select a small stone to carry to the east coast to cast into the North Sea at Robin Hoods Bay. Well …. we’ve started what may become a new tradition. As well as dipping our boots in the water, we selected three stones. 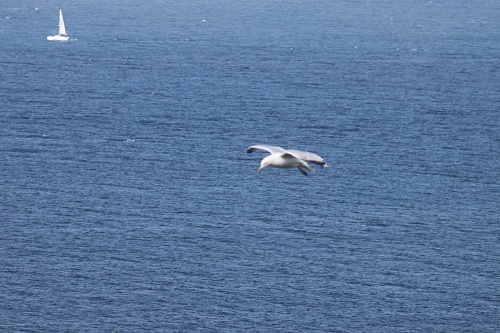 The first was kissed with the second and then cast into the Irish Sea. The second was secreted in each of our packs to be carried across England and then cast into the North Sea. 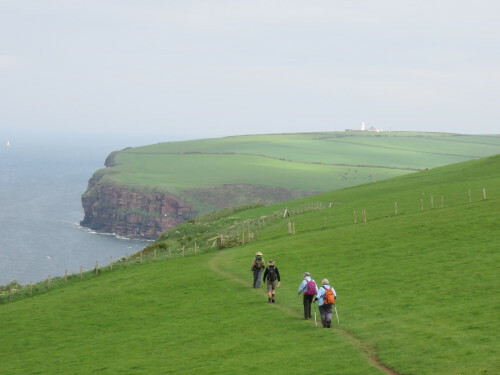 This will mark the conclusion of our C2C Odyssey at Robin Hoods Bay. And the carefully selected third stone is a keeper (don’t worry, there are tons of rocks on the beach!). So our journey begins …. Here are three members of our team completing this ritual. Doug, the Soil Scientist in our group would have no part in it. 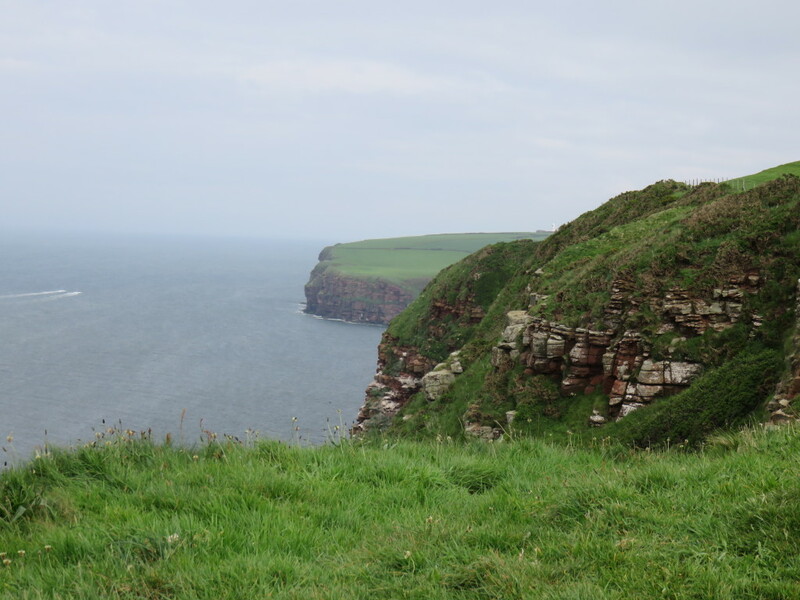 It’s just not right to mess with the geology of England by carrying rocks from one side of the country to the other! And as for carrying rocks to the other side of the world! 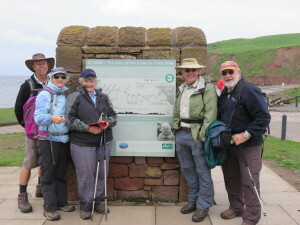 Then it was off to have the obligatory picture taken at the official starting point for the walk (see featured image) and we were on our way. 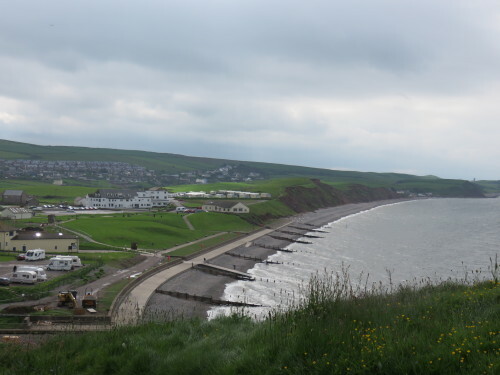 First we had to make our way up to the top of the St Bees headland, an ascent of about 100 m. Then it was time to take a last look at the lovely St Bees and we were on our way. It was close to high tide when we left, so there was only a rocky shore. 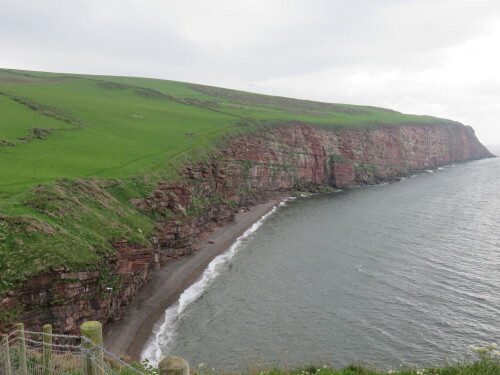 But when Julia Bradbury was here filming her 6 part TV series on the C2C (as screened on SBS several years ago), the tide was out, so there were several hundred metres of sand to traverse to reach the water’s edge. No such problems for us! The outstanding feature of our first day was the magnificent walk along the St Bees Head cliff-top. 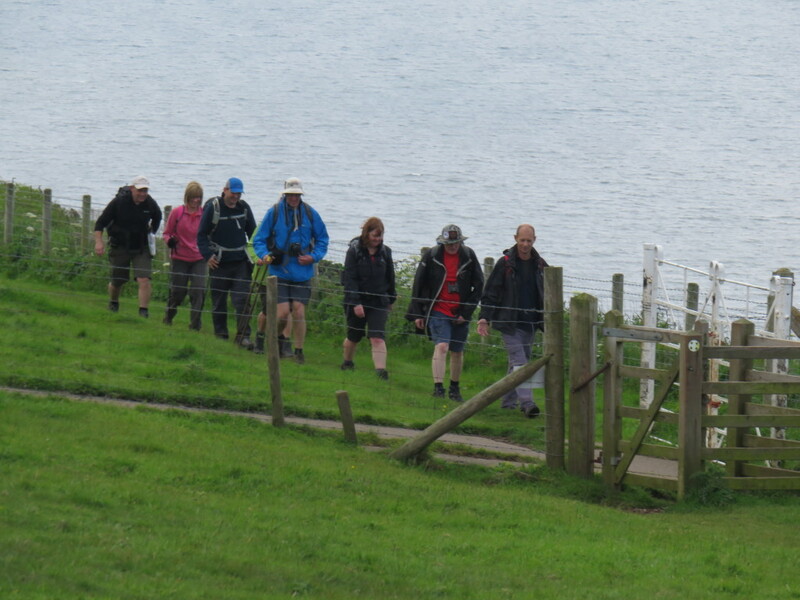 My co-walkers were setting a brisk pace, heading towards the first inlet in the headland – Fleswick Bay. 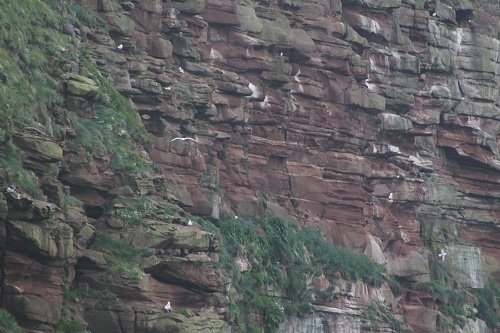 This is an area noted for its abundant birdlife on the cliffs. And our first glimpse of the St Bees Lighthouse can be seen in the distance. The views of the cliffs are simply spectacular. And the bird-life is a twitcher’s paradise. 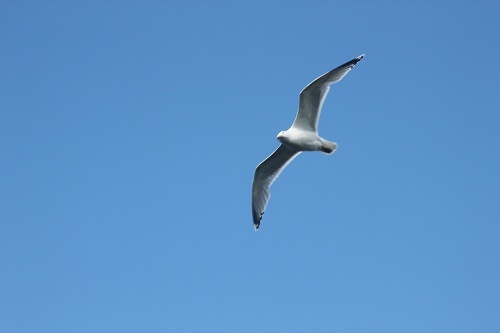 I know very little about birds, but enjoyed the spectacle of it, and captured a few images as we moved along. 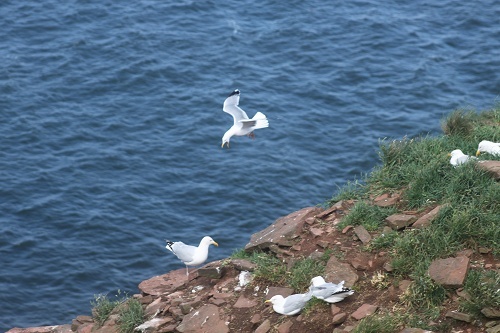 At one point, just beyond Fleswick Bay, a group of seagulls were hovering in the updraft of the cliff. And a fight broke out immediately after this photo was taken! Different people walk at different speeds. But some seem to move so quickly that it is difficult to see how they can appreciate their surroundings. 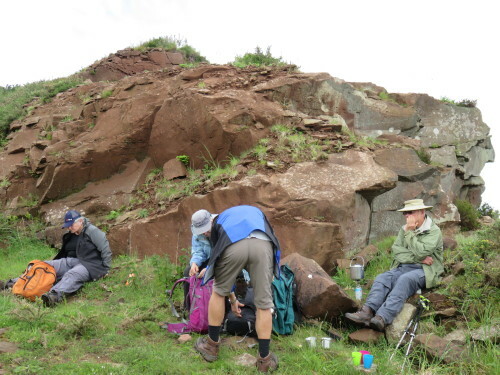 We called this group the Yorkshire fell flyers. 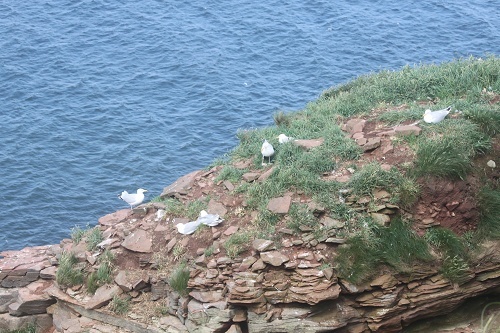 We saw them approaching us from a distance way back behind Fleswick Bay and pretty soon they were on our tails and pressing to get past ….. in an area where the path was very close to the cliff-top and quite dangerous. But we soon found a space to let them through. 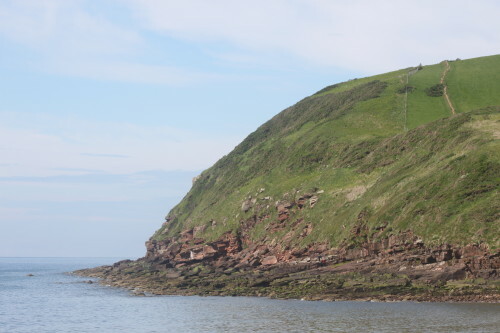 The St Bees Lighthouse is interesting in that it was originally lit by burning coal. I’ve not heard of this before, but apparently it was upgraded following many complaints from mariners about the poor quality of the light that it produced. The facility is no longer staffed. 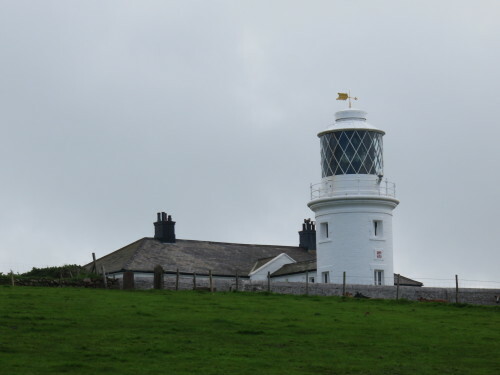 Sadly tours of the lighthouse that were available to C2C walkers until recently are no longer offered. 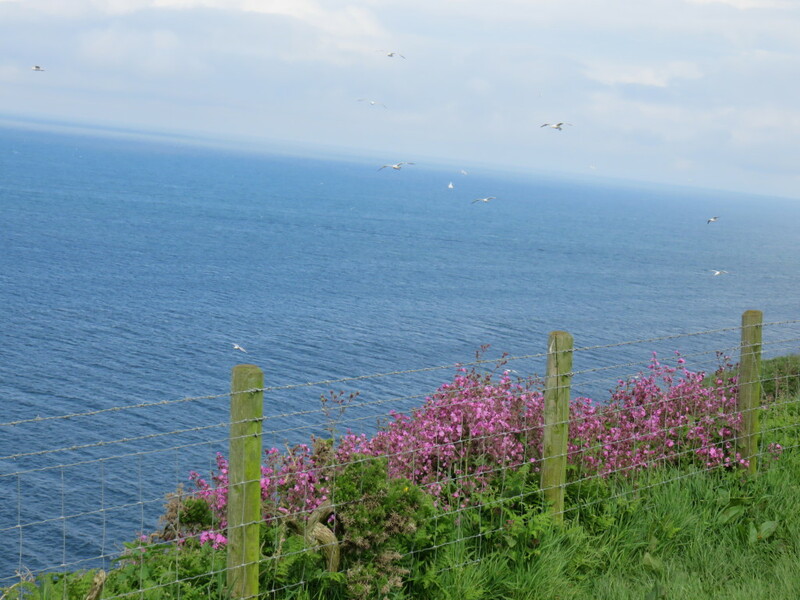 There is always a fence along the cliff-top. Sometimes the path is on the land-ward side of the fence, as seen here. These are predominantly sheep pastures. On other occasions, it is on the sea-ward side, and is quite dangerous in parts. But a constant delight is the wildflowers that can be seen growing on the seaward side where they are protected from grazing. 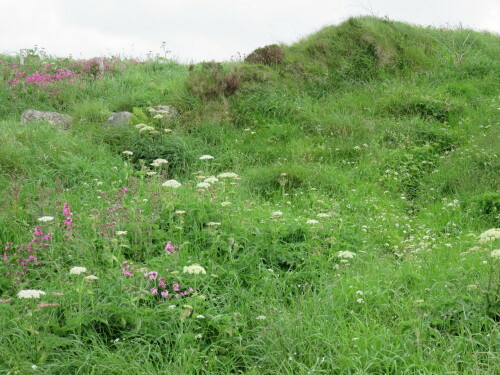 In this area, the pastures are mainly grazed by sheep. 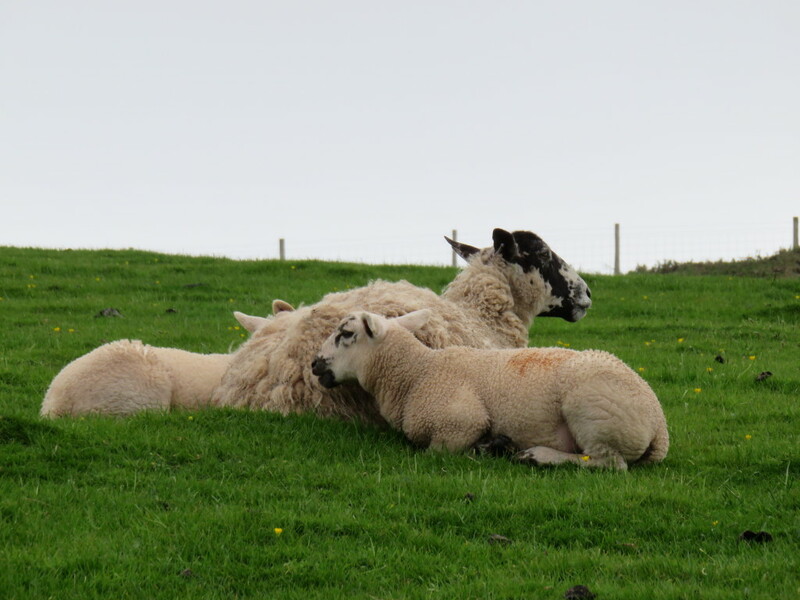 This little family seemed to be pretty content! and there were mainly twin lambs in this area – good genetics, I think. 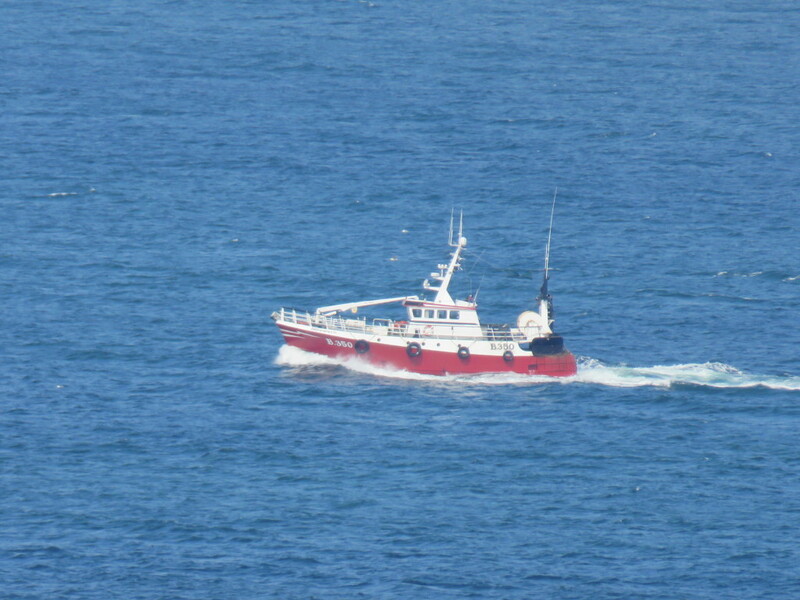 And heading out into the Irish Sea, we saw a fishing trawler. 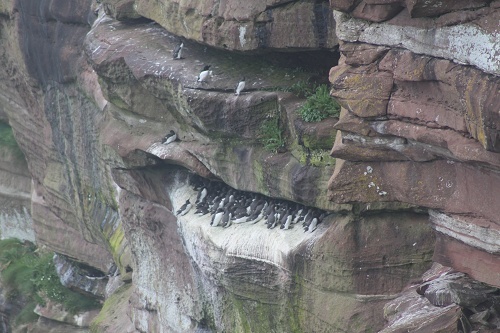 It may well have caught our dinner …. four of us later had seafood for our evening meal in a local pub in Cleator. In fact, Laurie declared that his Sea Bass dinner was the best meal he’d eaten since leaving home – even though he and Tricia had spent a week in Paris on the way to England! 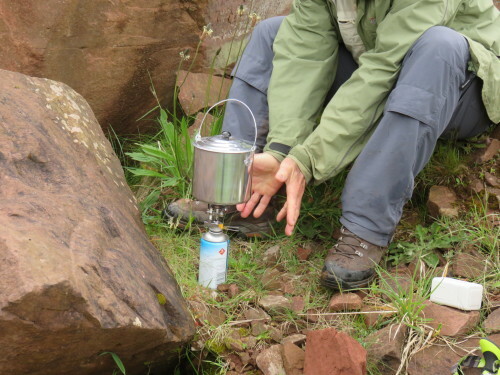 A feature of our walking day is to boil the billy once or twice along the way. We find this to be a pleasant and refreshing ritual. Here, we were very close to an old quarry, the signal for us to turn east towards Robin Hoods Bay! The C2C path then took us along some local roads as well dedicated walking paths to the small village of Sandwith (Pron: Sanith). 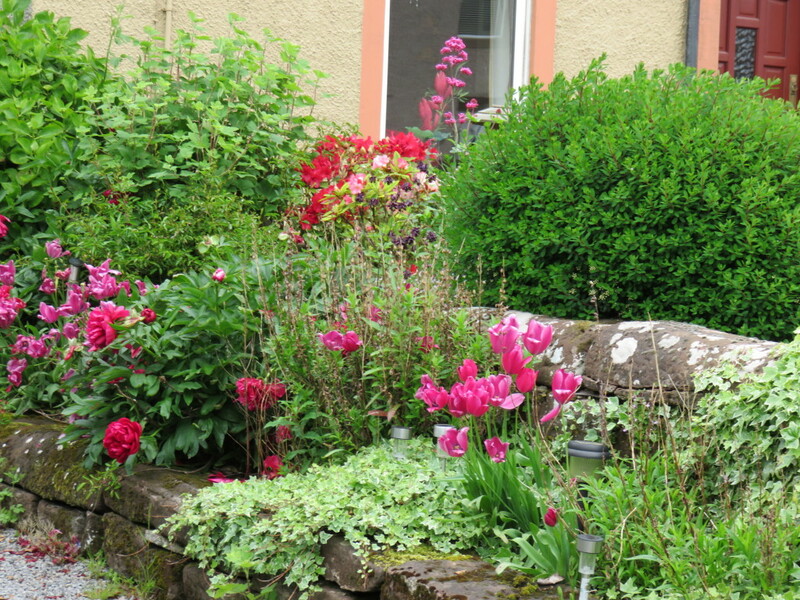 There was a pleasant village green and many attractive gardens. This was a rare sighting of tulips – surprising to us given the time of year. There was also quite a crowd enjoying a convivial interlude outside the local pub on their Monday Bank Holiday (what’s that all about …. we’ve had a few explanations? But not sure?). That’s our mob in the foreground having a little rest. 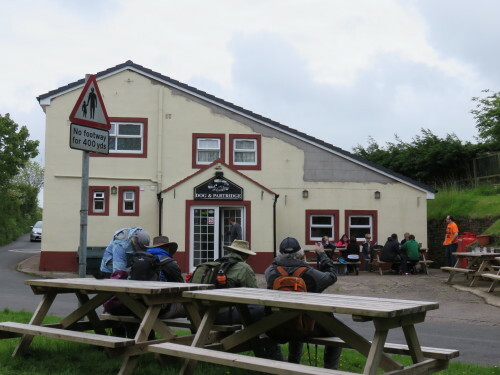 Definitely no ales until the walking is done! We were soon in the small village of Moor Row, close to Cleator. The final approach was along a very well constructed hiking and cycling path along a disused railway line. And lots of lovely trees and shrubs along the way as well. 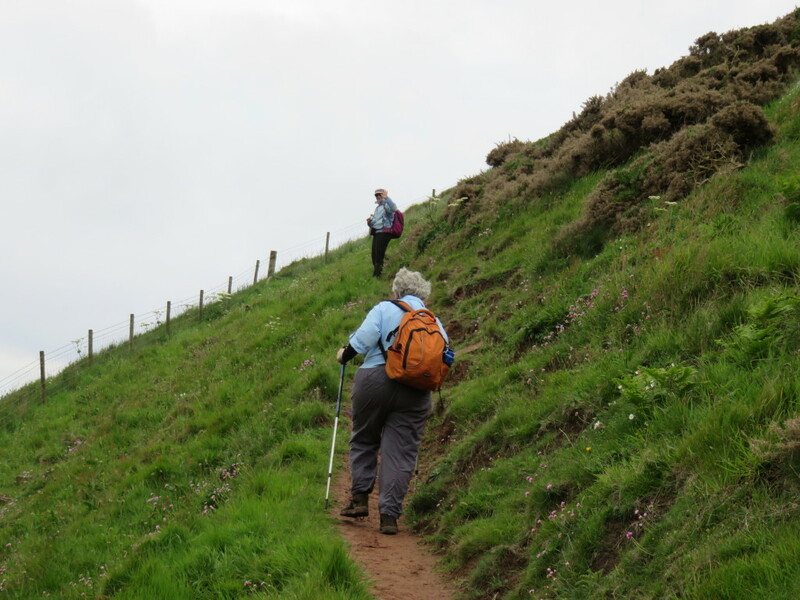 Should be more of them ….. nothing steep here! We were all very pleased to see the sign for Jasmine House as our delightful overnight B&B hove into view. And finally, a note to long-suffering readers. I’m new to blogging and so I’m learning ‘on the job’, with no-one to point me in the right direction. 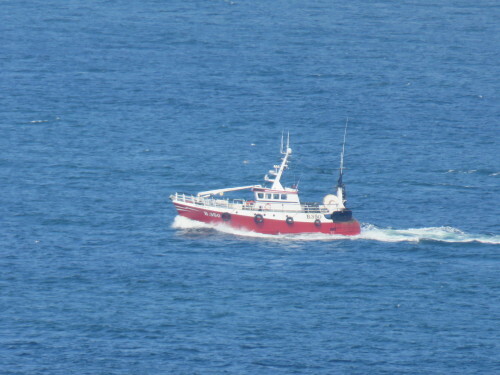 Brian (my brother and the owner of this blog) kindly gave me a couple of quick lessons before I left home – without that I would have been sunk! But you’ll be pleased to know that I am starting to swim faster! As well, there has been no WiFi on several evenings, even in one case where the management claimed that my bedroom was the best place in the building to pick it up! I’m also working with a notebook computer with Windows RT on it – new to me and not the best for blogging, I suspect. During the last week in March, before this blog came to life, Attorney General George Brandis introduced to parliament an exposure draft of changes to the S18c of the Racial Discrimination Act. Brandis goes beyond everyone’s “right to be a bigot”. He seeks effectively to protect the right of individuals, especially those working in the media, to use hate speech. Much of the discussion and commentary has been in terms of free speech. I agree with Mark that this is to mistake fundamentally the aim of legislation against hate speech. Its purpose is to provide redress against harm, harm felt by specific individuals and groups. It’s not about freedom of speech. It protects speech which is justified on several grounds – including literary and artistic merit (so the argument about Salman Rushdie is entirely specious). It’s about not doing harm through the expression of hateful speech. Comments on the draft are now being considered by the Government. There’s a whisper that they reconsidering, but the question is still open. You can send Abbott/Brandis a message by signing this petition against hate speech. In the following section I’ve laid out the nuts and bolts of the proposed changes. (i) to vilify another person or a group of persons; or (ii) to intimidate another person or a group of persons. (i) to a person; or (ii) to the property of a person; or (iii) to the members of a group of persons. Vilify means to incite hatred against a person or a group of persons. So the focus is now to be on vilification and intimidation (causing fear of physical harm). It’s OK to cause offence, insult and humiliate. The actual feelings of the target person or group are irrelevant. Acts are to be judged independently of their actual effects, rather on what their effects would be if perpetrated on some mythical average member of the dominant group in society. To me, humiliating someone means putting them down, diminishing their esteem in their own eyes and in the eyes of others. To do that on the basis of race, colour or national or ethnic origin is to cause personal and social harm, is racist and frankly appalling. It’s a form of bullying, is tantamount to violence and should be illegal. Some might argue that to tell the truth can involve offence and insults. Nevertheless I would argue that to offend or insult someone in relation to race, colour or national or ethnic origin means that you regard them as defective or inferior on those grounds. Again harm is done and I have no difficulty in making such acts illegal. Truth telling appears to have no relevance to Brandis’s notion of free speech. A person can be humiliated, in public, by someone telling a pack of lies, and that’s OK. In other words, anything goes in the name of free speech, accurate or not. That’s eleven categories imposing limits on what we are permitted to say in public. All in all Brandis has cooked a rather nasty brew, emanating I’m afraid from a rather nasty cook. Brandis should remember that the robustness of parliament has resulted in suicide attempts. He seems to want to live in “a world of unrestrained biffo all round”, to borrow a phrase from Grattan. “I think George saying this is about the rights of the bigots really laid bare the philosophy behind these changes. 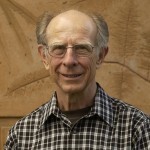 “For them, it seems to be an abstract philosophical or legal argument. For them it’s a game, it’s a debate about words and abstract principles. “For people who have experienced racism, it is a deeply personal debate, and it’s actually a debate about real people and real hurt. 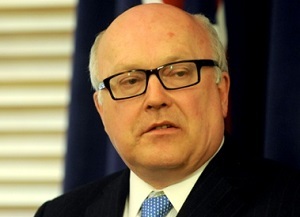 Brandis has struck a blow for bigots, especially one bigoted journalist – Andrew Bolt. That was Ben Eltham at New Matilda.